Having been caught off guard by my enjoyment of Heber Down Conservation Area, I figured I’d give the CLOCA (Central Lake Ontario Conservation Authority) another look over. Due to its proximity to the GTA, I don’t usually pay it much attention. But I did find an anomaly in their listings. Crow’s Pass CA caught my eye ‘cause it’s off the beaten path, and North of the populated centres. So, I looked it up to see what my peers had to say about it. Apparently there’s a spectacular Crows Pass trail in Alaska, but that was all I found, apart from CLOCA’s own dedicated sites. So it was kinda like my review of The Otonabee Gravel Pit CA where it appeared that no other independent reviewer knew of it’s existence. There are a number of reasons for this one’s anonymity though. For unknown reasons, it doesn’t even show as a green space on Google maps, and unless you know exactly where to find it, the name doesn’t show until you zoom in quite close on the map. It’s just West off Hwy 12, Brock St (NOT Brock ROAD) from Whitby at the 401. 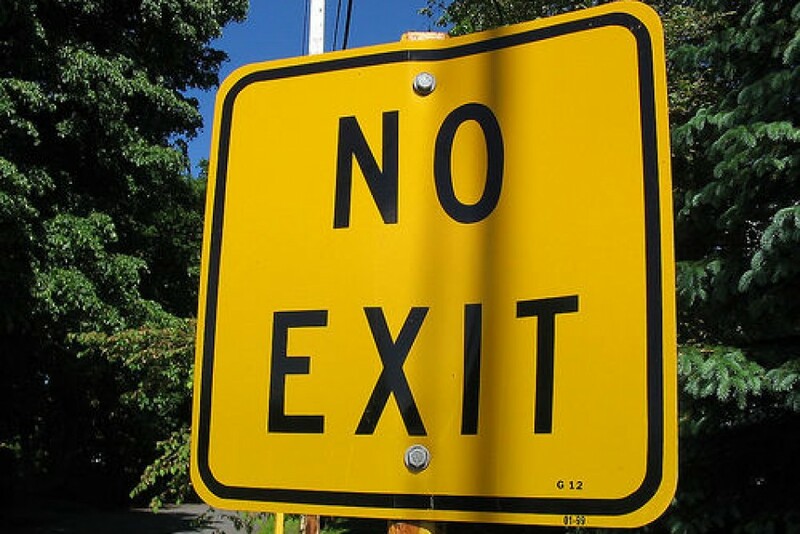 Once we got to the No Exit sign at the end of Middle March Rd, I still felt the need to quiz a young lady, walking her dog, as to it’s whereabouts. We could see a trail heading into the woods but were apprehensive, as it just seemed to enter a golf course. The young lady tried, but couldn’t help us much except to say that she’d seen a CLOCA truck pull away from where our car was parked, moments earlier. So we headed off into the “trail” for a few meters until we came out onto a golf cart passageway between two sections of a course. There was a trail continuing past the “golf cart 401” but it displayed a NO TRESPASSING sign. However, there was a clear trail heading back into the bush just to the left of the sign. We walked past it for a quick peek, and were greeted with the sight of a standard conservation area gate. Behind some shrubbery we saw the CA welcoming sign and so knew we’d found our elusive trail. That was a long, convoluted description of how to find this place but, as I’ve often mentioned, some of these trails are a task to find, and this one was particularly challenging, but well worth the effort. The Wife summed it up best when she said, “Regardless of the heat, humidity, and bugs … if you can walk away from a trail as impressed as I am right now … you just know it was a great trail”. As for the bugs, well, this year has been very good for them no matter where you go, so don’t judge this trail on that. However, I will describe it as hilly, which amplified the heat and humidity for us. In a cooler season, I wouldn’t have any issues with the topography. In fact, come coloured leaf season, I’d expect the views from the hilltops and ridges to be quite spectacular, and we’ll return to confirm. The Crow’s Pass trail loops up and down through mixed forest, sunny ridges, and deep dark lowland forest with year-round pools. 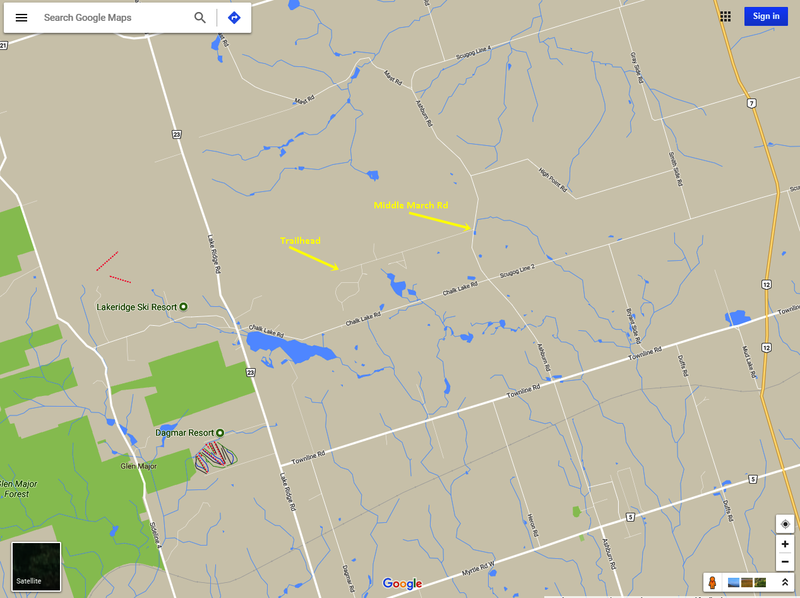 As the map shows, the Oak Ridges Trail runs along it for awhile. You’ll see it very clearly merge just after you pass the Maple Trail intersection, but you might miss where the ORTA trail pulls away again as it’s just a single-file path through the meadow further on. Worry not, the Crow’s Pass trail is very well marked, so there’s no chance of confusion. I sometimes suggest a direction to start a trail if there’s any way to reduce the severity of the hills. I’m afraid it won’t make any difference on this trail. The Maple trail just provides a well canopied walk through a predominately maple forest. This trail is very rewarding. The terrain was as varied as any we’ve experienced anywhere. The lowland forests rang with birdsong, and offered unimpeded views of the underforest. The highland ridges presented vistas of the immediate surroundings from above, while the lowland stretches presented a clear sky view up from the valleys. Both trails are wide enough for two to walk side-by-side. I won’t recommend you start from any particular direction as it doesn’t matter. The inclines are about the same, from either direction. There’s no parking lot, no picnic facilities, and no rest benches. Mind you, the combined trails are only about three kms long, but in the heat and humidity of August I’d have welcomed a rest spot at the crest of any of the many hills. This trail promises to be lovely in the Fall, what with all the deciduous trees. Perhaps due to its seclusion, I didn’t see a single piece of trash on the entire system. I gotta like that. By the way, that no trespassing sign just means you’re not to wander off across the golf course (like that’s every hiker’s wildest dream eh ?). When you walk up to it, you’ll notice the angle it’s on, faces that direction. You can walk past it to the left to access the trailhead. Thanks so much for this! 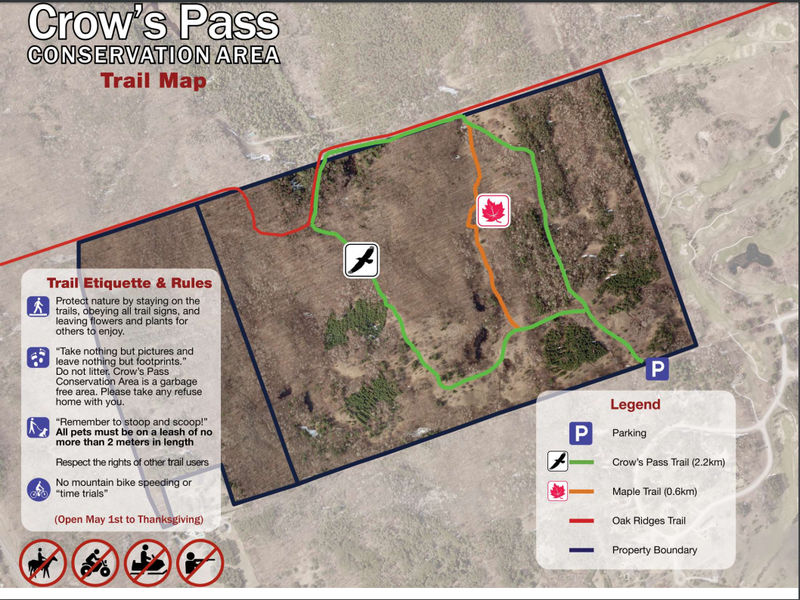 My family headed out Saturday afternoon for a hike after seeing Crow’s Pass Conservation Area on a list of Scugog trails but were pretty much stumped when Google Maps showed us a location that was clearly off the road with zero signage in the middle of a golf course. We were just about to leave again when we found your details and had a fantastic hike with the kids. And I’ll thank you for your kind comment Len. Yes, some of these trails are challenging to find, but I swear they were deliberately trying to hide Crow’s Pass. Not to worry though, the other 50+ trails listed on our site are considerably easier to find.